After the recent deluge, it would appear that the 340+ leaky dams built in Hardcastle Crags have done their job, at least in part. You can view footage, taken and narrated by our chair, Bede Mullen, on the project page. Stuart Bradshaw, founder member of Slow The Flow Calderdale, and our Technical Officer, has inspected the sites throughout Hardcastle Crags, and these are his initial thoughts and findings as a result of Storm Hannah this weekend. 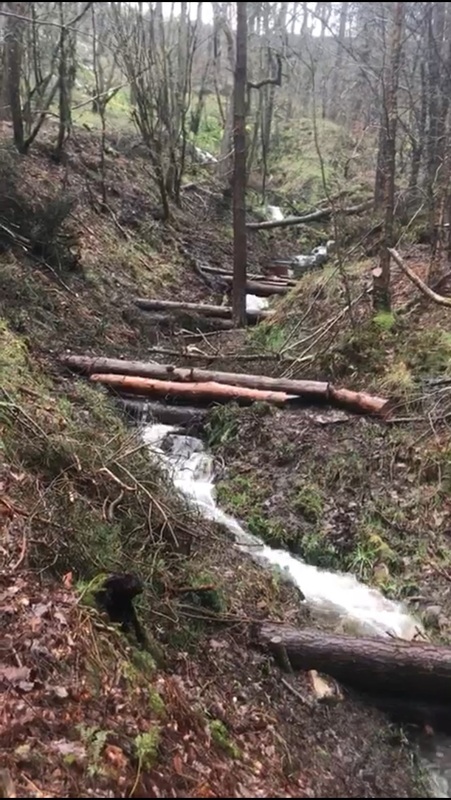 Our leaky dams at Hardcastle Crags, working hard during the flood event on 16th March 2019. On this occasion, Todmorden, Mytholmroyd, and Sowerby Bridge all flooded. Hebden Bridge (directly downstream of Hardcastle Crags) narrowly escaped serious flooding. We suspect and hope that our 350 leaky dams contributed to keeping some of our neighbours dry. The river gauge at Gibson Mill, upstream of many of the interventions, peaked at 13:42 at a height of 1.296 metres. At New Bridge, downstream of all the interventions, at 13:42 the hydrograph read 1.533 metres. The peak at New Bridge occurred 2 hours and 52 minutes later at 16:36 which was at 1.672 metres, at the same time at Gibson Mill the gauge had fallen to 1.162 metres. The distance between the two gauges is about 2 km, which would not explain the length of this delay. There is arguably a second peak at Gibson Mill, as after falling from 13:42, it rose again to 1.240m at 18:56 and plateaued until 20:00, during which time the New Bridge gauge was falling. I am wondering if this is anything to do with the storage area just beyond Gibson Mill, having reached capacity, over-topping the logs. Data from the river level monitors can be viewed here . I went out to inspect our work on the morning of the 16th March, where many of the dams were performing well – although some could do with additional brash stuffing. The plate weirs installed on the stream without leaky dams (the control stream) were swamped, i.e. water was passing right over them rather than just through the notch. On the stream with leaky dams, the upstream plate weir had pushed over slightly and was leaking badly from the sides. The downstream one, however, beyond the leaky dams, was not swamped and I did manage to time a bowl filling. Not very accurately, because it was one second or less, but nevertheless, the flows were markedly slower in this stream. I was also on site on the 17th March, checking on the dams following reports of floating logs in Hebden Water on Facebook. I can confirm that none of our logs have moved from where they were placed. 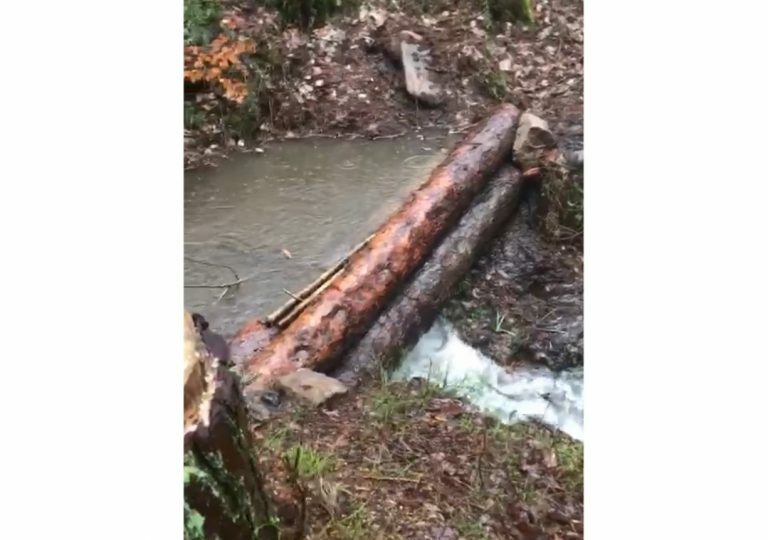 This is not surprising, the stream forces in the feeder streams are not strong enough to mobilise logs that are dug in or secured behind stumps etc, as ours always are. In gullies which had been stuffed, all of this material has remained in place. There are two places where water was running down the access track. One is near to Gibson Mill on the right, which could be rectified by additional log placement, diverting the water back to its previous path through the drain passing below the track. The other place was near the open field I believe to be called Lumb Folly, but I think this was due to a blocked drain. There were dams working well, and dams working less well, in this bigger flood event. Some of the dams could do with additional brash, which could be provided, but in many cases will gather naturally with time anyway. The contour-placed logs that intercept flow on the slope not far from Lumb Folly on the right were working well. There was very little water yesterday on the flow path at the access track. This meant that the holding area on the plateau by Hebden Water below, was not holding as much water as I expected. At the bend in the access track not far from Gibson Mill where we created two storage areas, and where we built dams in January 2018 with the EA and CMBC staff, it was completely dry. One small stream which enters this area now sinks behind a brash leaky dam, which explains some of this, but a stream which did flow off the cliffs above doesn’t appear to flow now. The leaky dam just past Gibson Mill before the mill pond was working well, as were the holding areas further to the north near the turning circle, which are turning into wet woodland. The large leaky dam here at the very top could do with extending to pick up an adjacent stream and divert it into this wet area. In conclusion: a lot has been achieved since April 2017 when the first leaky dams went in. There are now in excess of 340 leaky dams of one sort or another, and the results, whilst not conclusive yet, are certainly evident in terms of visible storage, over bank flow and infiltration. The hydrograph for this bigger flood event, in contrast with those we have observed for smaller events, does appear to have a delay on it at New Bridge compared with Gibson Mill. That is positive because it shows that the dams allow watercourses to behave normally when there is no threat, and act to slow the flow when there is risk of flooding. We will be publishing further results as the year progresses, and will soon be announcing camera points, where you will be able to help us with our ‘citizen science’ project by taking pictures of the dams from fixed locations – watch this space! Also, if you are visiting Hardcastle Crags, look out for the 300+ leaky dams. They can be hard to spot, but you can have a lot of fun looking for them! If you want to take part, our next volunteer day building leaky dams is Sunday 31st March at Hardcastle Crags at 9.30am – see here for details. This is really encouraging and good feedback is much appreciated after some back breaking work last summer, and as mentioned previously if fresh growth develops around the leaky dams then they should hold more water for longer really good encouraging results.